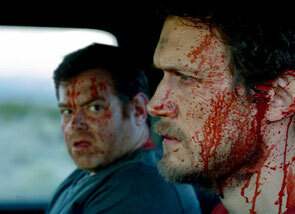 Southbound manages something most anthology films do not: cohesion. Instead of mashing together a bunch of unrelated scary tales within a weak framing device, the film connects its individual stories thematically. It’s sort of the horror equivalent of last year’s very good Wild Tales, a drama-thriller-comedy focused on revenge. Southbound’s episodes deal heavily with shame and regret. A desolate stretch of desert highway is the fittingly stark setting, established in the first story entitled “The Way Out.” Two blood-speckled ne’er-do-wells (Matt Bettinelli-Olpin and Chad Villella) attempt to outrun their demons – quite literally – in a pickup truck. We don’t know exactly what they did, but the brisk opening effectively sets the mood. A radio deejay helps set the stage as well, intoning, “All you sinners running from your past…regret and remorse, that’s life right?” It certainly is in Southbound. It may sound a little on the nose, but it works here in a “Twilight Zone” kind of way. The strongest stretch of the film comes in segments two and three. In “Siren,” a band comprised of three young women (Fabianne Therese, Nathalie Love, Hannah Marks) gets a flat tire on the dusty stretch of road and a seemingly kind couple offers to help. Of course, the mannered strangers are actually weirdos with ulterior motives. Director and co-writer Roxanne Benjamin doesn’t make the segment all about standard twists, including an uncomfortable dinner and ritualistic behavior, smartly mixing the tropes with past interpersonal drama. The rock group that’s now a trio used to be a quartet, and the guilt associated with what happened is a big part of the story. Just as we’re about to get a pat ending, “Siren” flows directly into David Bruckner’s “The Accident.” Driving distracted at night while talking on the phone and looking at pictures of his girlfriend, Lucas (Mather Zickel) runs over a young girl in the middle of the road, badly wounding her. Typically, in this horror movie scenario, Lucas would speed off and be haunted by his victim (a la Creepshow 2), but after giving it very little thought he calls 911. Unable to lock down his position, the dispatchers instruct him to drive into town where he finds the hospital, except it’s completely abandoned. The operators tell Lucas the only option is for him to perform life-saving surgery on the girl as they walk him through it step by step. It doesn’t go well, as you may imagine. But as you might not imagine, what happens is more than just gory – it’s inspired insanity. The only brief dip in the elevated horror is “Jailbreak,” in which Danny (David Yow) attempts to rescue his long-lost sister Jesse (Tipper Newton). The segment isn’t bad and doesn’t drag the film to a complete halt, though it’s paranormal elements are half-baked and aren’t given time to connect to the human drama within the short run time. Part of what makes Southbound enjoyable are elements of ambiguity, but in “Jailbreak” implications are more elusive. Finally comes “The Way In,” directed by the collective Radio Silence. They also handled the opening segment, and the wordplay in the titles gives a clue to where we may end up. A couple and their teenage daughter are staying in roadside accommodations (that may look familiar to us by this point) when masked tormentors appear outside. The home invasion setup gets all the necessities of plot (cops 30 minutes away, etc.) out of the way quickly before getting to the climax, which is a satisfying end to this one segment and the film in its entirety. With adherence to theme and tone, Southbound creates a consistent creepy atmosphere that doesn’t rely on jolts or loud music cues to bring the chills. Individually and as a whole, the stories tap into the fears of not being able to escape misdeeds, from unbelievably reprehensible acts to careless lapses in judgement. Danger is always lurking, and so is comeuppance.